Racing games are always fascinating and addictive, today at Techtabloids we are presenting an Android racing game speed car. The game has three cars to choose from although only one is unlocked by default while the other two cars Player has to unlock by playing game and achieving respected score to unlock cars. 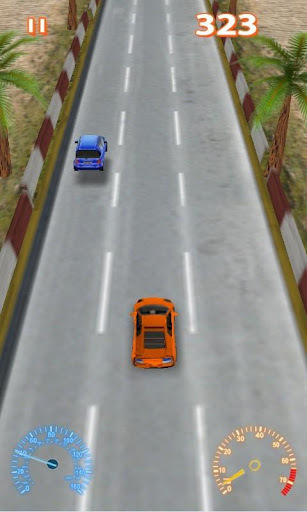 The gameplay is interesting and easy, there will be a car which player has to drive and drive carefully, to move right and left tilt screen in those directions, there are no opponents in this game, the only thing which matters is drive carefully not to touch with any other car in the traffic and with the side walls too, if players do so the race will end. The player can boost the speed of the car also, just place your finger anywhere on the screen and hold the car speed will boost as long as Player hold. You will get points on covering a distance and passing by other cars in the traffic, as we have mentioned above there are two more cars that player has to be unlocked, so to unlock those cars player has to achieve scores of 60000 and 80000 respectably for each car. Graphics are not much highly but relatively fine, cars are recognizable in traffic. The theme is fine too but no multiple tracks there is only one track. According to me is a fine game, you must try it out it’s a free game. The player will get addicted towards this Android Game.